When purchasing turf, with your dog in mind, you soon find that each grass variety has its strengths and weaknesses. It is then up to you to decide, based on your geographic location, the best lawn for your home and your dog. 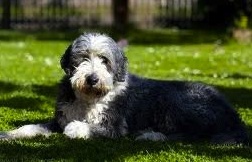 Usually dog owners consider purchasing a lawn that can cope with high traffic – such as a constant pacing dog. The wear and tear placed on turf by an active dog, or dogs, can put enormous stress on the grass. Therefore dog owners should consider a grass type which will firstly tolerate the wear and tear, and then have the ability to quickly repair itself when it does get damaged. Kikuyu Kenda® is probably one of the most popular turfs for dog owners as it has the best wear and tear, remains green year-round and is also fast growing. It is also found in yards where large, active and sometimes naughty dogs may live. Unlike common Kikuyu, the Kenda® turf variety has proven to have a strong and more vigorous root-growing system, resulting in a quicker establishment period and it being better suited to “tough dog” wear tolerance. From planting to cutting – good quality Kenda® turf is produced in just five to eight months – with an amazing quick regrowth period. Kenda® turf is also great for sunny home lawns that require the ultimate in wear recovery. It’s quick repair capabilities make it ideal for energetic dogs, kids playing in the backyard and lots of backyard sports and parties. A variety of choice would be a couch called OZ TUFF®. In terms of suitability, it meets all categories such as residential, commercial/industrial, parks and sports fields and ‘dog’ tough. In fact, OZ TUFF® has shown to have improved wear tolerance compared to other turf species like blue couch and Kikuyu and other green couch varieties. OZ TUFF® was also ranked number 1 for its wear tolerance and recovery following wear studies conducted by the former Redlands Turf Research team for wear tolerance (Roche et. al, 2012). Another feature of OZ TUFF® is that it grows on a wide variety of soil types and can be watered with poorer quality water. Grown Australia-wide, Zoysia is a tough wearing, low maintenance grass that thrives in extreme heat or humidity. It has excellent cold hardiness and most importantly has an eye-catching dark green colour. Zoysia turf has a fine leaf, a soft texture and feel that tolerates being neglected or trodden upon very well. EmpireTM Zoysia is one of the easiest growing varieties in the market place. It is an adaptable lawn which is well-suited to Australian conditions, from Darwin, to Tasmania, Sydney to Perth and will even survive in sub-zero conditions. It has performed well in all soil types and with its aggressive deep-rooted system endures tough conditions and tough wear from dogs and children. EmpireTM Zoysia requires less maintenance and mowing than other grasses and is an efficient water user. Its developed roots and underground runner system allows faster growth and less fertilizer. Yearly fertilizing should be sufficient.